Earlier in the newscast, we reported about two shootings in the city last night. 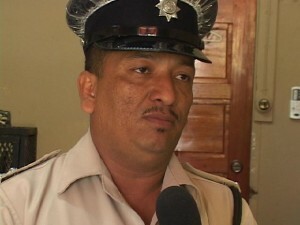 But earlier in the evening, in Orange Walk Town, an armed robbery was reported at a local Chinese store. The thieves managed to get away with cash and other items and the shopkeeper was shot in the leg. News Five spoke to Assistant Superintendent Selvin Tillett who says they are reviewing surveillance tapes for clues. Luckily, the shop attendant’s injuries were not life threatening. i think that orange walk should have a check point with armed police and bdf at the entrance by el establo right before trial farm and one at the junction with maskal cut off by carmelita. all those that appear suspicious or not even that, those that are not from orange walk to be stop and questioned what they are going to sugar city for. they should not let those crazy lucking people from the city go to orange walk because all they do is go and give trouble, watch at san pedro, san pedro has been plagued by crime lately, and guess what…it is those same one from belize city going out there and stealing from the hard earning people. i think we should place all criminals in public places and stone them to death with stones no bigger than a baseball…i just hate those fool…kill them all….